A number of people have hit me up to ask about Bitcoin so instead of repeating myself to multiple people, I’ve decided to make a post. You’re all welcome. Now, I’m not an expert in cryptocurrency so don’t say that I gave you that impression. This is a personal blog. These are just my opinions. Do your own homework. Alright? Good. Let’s begin. What in the galaxy is Bitcoin? Bitcoin is essentially a virtual currency created through complex mathematical calculations and designed to have a unique identifying and anonymous code, all managed through a distributed ledger technology known as the blockchain. It was created in 2009 by some Satoshi whatever guy who clearly used a pseudonym and whose real identity is yet to be ascertained. You can read his white paper here. Without boring you with the details, the beauty of Bitcoin is that it is anonymous, hard to produce(mine) and not tied to any central banking authority giving it all the anonymity of cash and all the virtual capability of credit cards. So it is money that you park on the internet and can spend/transfer across cyber space as well as exchange it into physical money of any country in the world as long as you find a buyer. Bitcoin eventually blew up in popularity, becoming the preferred monetary instrument for buying and selling on the Dark Web where people can buy drugs, weapons and so on anonymously. Soon, people realized it was also a good way to move money from country to country anonymously and outside the control of government authorities. So demand for Bitcoin soared, leading it to go from less than 10 cents per Bitcoin back in 2009/10 to over $1,210 per Bitcoin today. Basically Bitcoin went from being worth as much as pure dirt to around the price of an ounce of gold, in a few years. I myself bought Bitcoin a year ago after studying it seriously for a few weeks to try to understand what drives its value. I bought it at $450 and currently have a gain of around 120%. My verdict? Capital controls, money laundering, tax evasion and the like. It’s like having a gold vault that is completely anonymous yet completely portable. Anyone who wants to hide money will likely put it in Bitcoin in 2017, especially with the demise of traditional anonymous banking in places like Switzerland and co. The raw percentage increases in value that we saw in Bitcoin might never repeat itself (or it might, who knows) but there’s a healthy argument to be made that it will still appreciate considerably in the coming year. Reason? China. China pretty much drove the value of Bitcoin in 2016 and is set to keep doing that this year. As China’s dollar reserves has dwindled close to the threshold necessary to manage their currency and money supply needs vis a vis the US dollar, they have been clamping down on capital controls to prevent money leaving the country for better destinations. Companies, high net worth individuals and financial companies have already seen increased difficulty getting money out of China in 2016 and if the indications are correct, that’s going to intensify in 2017. Enter Bitcoin. Bitcoin has become people’s preferred way to sneak money out of China. And we’re talking a LOT of money. Being that the supply of Bitcoin is pretty small and it’s acceptance is global, the demand will keep pushing its price higher. I fully expect it to end the year well above $1,600. Based off that, I can say that it’s still a good investment to make. Like all investments, the theory may not pan out. It may dive instead. China might get creative about clamping down on people buying the currency. There are ways to do that. So before you buy, do your own thinking, make up your own mind. 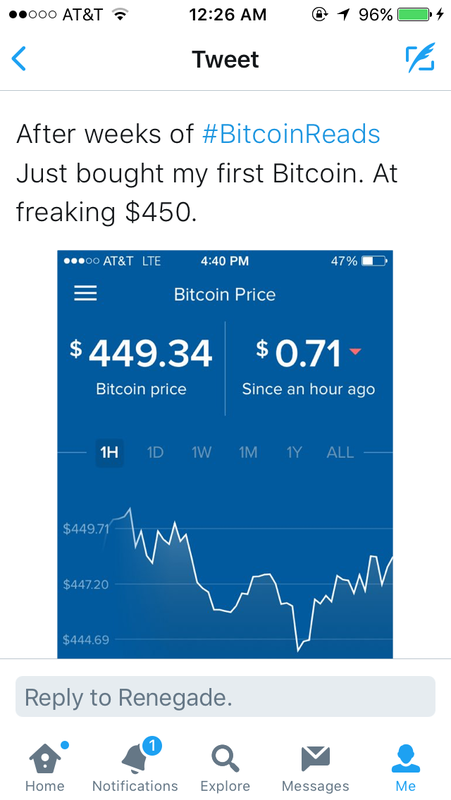 I bought my Bitcoin through Coinbase. It’s a private company owned Bitcoin exchange for speculative buyers like you and me. Sign up, confirm your ID, link your bank card and buy. Selling is just as easy. A number of people who have asked me about Bitcoin are in Nigeria. As far as I know, Coinbase doesn’t operate in Nigeria. But I know some people taking folks money to buy Bitcoin in their name. I can’t recommend that since I’ve never used it. You might need to figure it out, or hit me up on Twitter @eldivyn and we can work through your case. Otherwise, best of luck. That’s what I wanted to share on Bitcoin. Hit me with any questions. I have an investment/trading/asset management company on the way. My team and I will invest your money for an agreed upon interest for at least 12 months. I’ll share info when some things are all set but if you want to discuss with me privately about this in the mean time, DM me on Twitter.